This spirited one-man show could just as easily be called ‘Fathers 4 Justice: The Musical’. Totally owning this slick, rousing production, actor-singer-dancer Michael Rouse is massively endearing as Colin Bradley, a man in his late 30s facing an unseen judge in a custody battle over his 13-year-old daughter Emily. As Colin begins his courtroom plea, fiddling with prompt cards and fighting back nerves, his story flashes back to the beginning of his relationship with his ex-wife. He sings and dances his way through the birth of his daughter; his first parenting steps; a stupid mistake; a messy separation; and a very public stunt to make himself heard as a father who’s being kept at an upsetting distance from his own daughter. 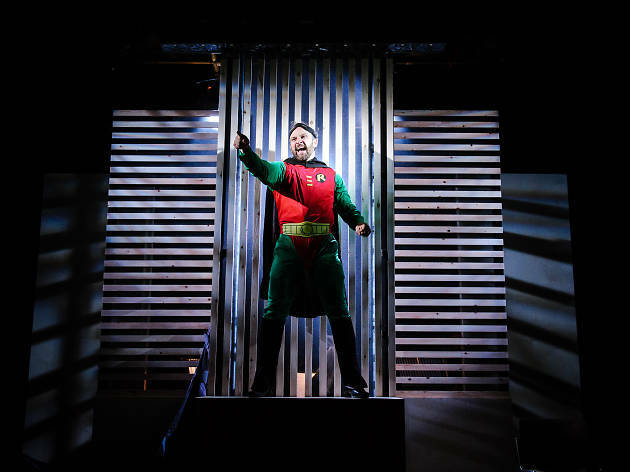 ‘Superhero’ might sound sombre, but that would be wrong: it’s lively, wry and often very funny. The writing trio of Michael Conley, Joseph Finlay and Richy Hughes aim for a belting, fairly generic West End musical style that more than fills the small Southwark Playhouse studio space. Georgia De Grey’s economic set manages cleverly to evoke both a wood-panelled courtroom and a small section of Big Ben, while also neatly hiding three musicians who you can just make out in the gaps. It’s a neat solution. This is a one-sided tale, but that’s sort of the point. You’ll have to decide yourself how much you sympathise with the aggrieved dad in this family fallout, but the play itself avoids too much special pleading, aiming instead to evoke a fairly universal sense of compassion and fairness. I found the more everyday, relatable elements of Colin’s story – observations on childbirth, schooling, just being a father – more interesting than the later section when he behaves like most separated dads don’t: by scaling the Palace of Westminster in a superhero outfit. 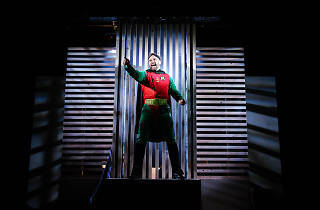 But Rouse keeps this unusual show lively and warm throughout, helped hugely by the ample humour in the lyrics. This show is outstanding. I saw their second preview and it was wonderful. The one man show features Michael Rouse who should be a household name. His performance is remarkable. The piece is relevant, humorous and heartbreaking in equal amounts. The music is beautiful, orchestrations are lovely and the show has been put together so well. The piece itself is fantastic - very clever with witty lyrics and a strong book. I think it will do very well - Do go and see it!! !